OSPF has certain limitations when configuring multiple areas. One area must be defined as the backbone area known as Area 0. It is referred to as the backbone area because all communication must pass through it. All other area should physically connect to Area 0, and all routing information disseminated to other areas will pass thorough this area. It must be established between two ABRs that share a common area. One of the two ABRs must connect to the backbone area 0. When virtual links are implemented, special processing is required during the SPF calculations. The next-hop router must be determined to provide the true cost to a destination across the backbone. In addition to connecting areas that do not physically connect to the backbone area, a virtual link can also be used to patch disconnected backbone areas. Discontinuity of the backbone area 0 can occur for instance when a two companies running OSPF merge and need to connect their two separate networks into one single network. Alternatively virtual links can be used to provide redundancy where a failure of a router may cause the backbone area to be split into two separate network causing discontinuities in network connectivity. For the purpose of adjacency, OSPF treats two routers connected by a virtual link as an unnumbered point-to-point backbone network; due to the fact that they do not share a physical connection and the IP address of the connected interfaces do not share the same IP subnet. Configure the hostname of all routers to indicate the Routers ID R1 – R7. Configure the enable secret password as cisco on all routers. Configure all other passwords as sanfran on all routers. Configure the Ethernet interface IP addresses of all routers as shown in the network diagram. Configure the Serial interface IP addresses of all routers as shown in the network drawing. Configure the serial interface between R2, and R4 to be in the first OSPF Area 0 as shown in the network drawing. Configure the serial interface between R2, and R5 to be in the first OSPF Area 0 as shown in the network drawing. Configure the Ethernet interface of R4 to be in OSPF area 20. Configure the Ethernet interface of R5 to be in OSPF area 30. Configure the serial interface between R3, and R6 to be in the second OSPF Area 0 as shown in the network drawing. Configure the serial interface between R3, and 7 to be in the second OSPF Area 0 as shown in the network drawing. Configure the Ethernet interface of R6 to be in OSPF area 40. Configure the Ethernet interface of R7 to be in OSPF area 50. Configure the serial interface between R1 and R2 to be in OSPF Area 2 as shown in the network drawing. Configure the Ethernet interface of R1 to be in OSPF Area 10 as shown in the network drawing. Configure R1 and R2 to use OSPF Area 2 as a virtual link to OSPF Area 10. Use the show ip ospf border-routers command to display the internal OSPF routing table entries to the ABRs and ASBRs. Use the show ip ospf virtual-links command to display parameters about the current state of OSPF virtual links. Use the show ip ospf process-id command to display information about each area to which the router is connected indicating whether a router is an either ABR, ASBR or both. Network = network link-state information. Asbr-summary = information about ASBR link state. External = information about autonomous systems external like state. Database-summary = database summary information as well as totals. Configure the serial interface between R1 and R3 to be in the OSPF Area 2. 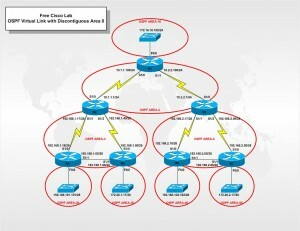 Configure R1, R2, and R3 to use OSPF Area 2 as virtual link to connect the two discontinuous backbone areas. Verify that all ip routes are displayed in the routing table. Verify full connectivity to all interfaces. Are there any issues and if so how can they be resolved?